The GOLD PRICE closed off 2.5% (-$31.20) at $1,207.90 on Comex. SILVER tripped 45.6¢ (2.8%) to end at $15.329. Should you have a straightedge and a pencil, you could draw a line from gold’s $1,205.70 June high across the October high at $1,191.70 and keep on drawing it eastward until you run out of paper. Where that line crosses current trading, you will see that it just caught and supported the jiggle before gold broke through $1,200. Jes’ look. And today’s low came at $1,191.50, right at GOLD PRICE October (last) high. 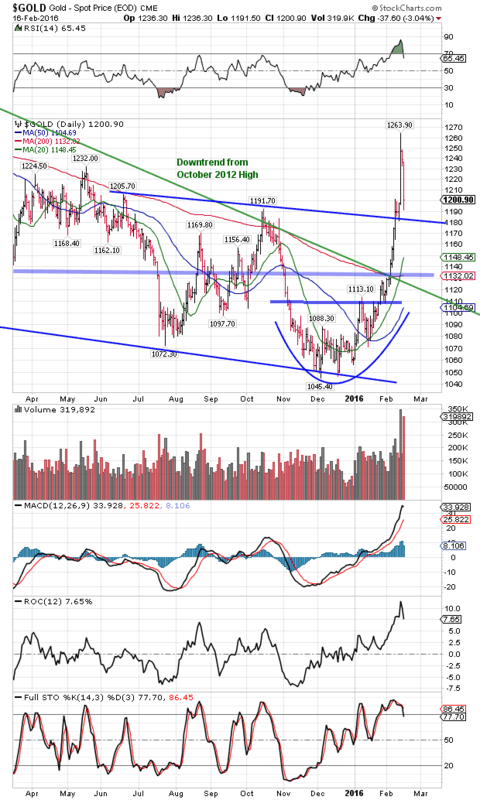 Lo, twas a parabolic move gold made, and a correction is in order and typical. Will probably last the rest of this week and maybe longer. Offers y’all a perfect opportunity to load up. Silver’s chart looks a little different. Silver has retreated from $16.00 nearly to the 200 DMA ($15.10), a likely target for this correction. Things are not what they seem. Don’t let today’s action fool you into discounting the proof of a trend change by last week’s silver and gold price breakout. Just relax and ride the pendulum. Things are not always what they seem. I beg you to notice a Trial Balloon floated today. I don’t think it was merely the wild saying of a rogue operator, because the speaker, Neel Kashkari, is president of the Minneapolis Fed, a former Goldman-Sachs-ite, and one of the main hatchetmen in the 2008 bank bailout. Given all that, why would he make a speech calling for breaking up the Too Big TO Fail banks, and even nationalizing them (by regulation) and taxing loans to reduce speculation? In other words, more government control and protection. Shucks, yeah! That’s what got us here in the first place. Not his idea, I’m guessing. He’s carrying water for somebody else, way higher up. Clearly, there is no rest in Establishment-land as they watch central banking and the economy unravel faster than a polyester Walmart sweater. Things are not what they seem. Y’all might think that because gold fell 2.5% today and silver 2.8% that the enormous breakout last week was a fluke. Y’all would be wrong, too. What you saw was usual market behavior. On Monday the Chinese government came back after the holidays and raised the yuan’s peg to the US dollar. All the stock cheerleaders around the world and on Wall Street jubilated, taking this as a sign the central banks would bail them out again by printing more money. Ran up US stocks and the US dollar today, too. Pause to reflect I mentioned to y’all earlier there was most likely a C-wave up in stocks, and a correction in gold and silver, coming this week. I ain’t no clairvoyant, and crystal balls ain’t necessary to know that a long, hard, parabolic rise or fall is followed by a reaction, often sharp. Si monumentum quaeris, circumspice — If you’re looking for a monument, look around you. That’s what’s happening, not the end of a gold and silver rally that’s just begun (and will last years) or the end of a stock decline that’s just started (and will last years.) Up and down, back and forth — that’s what markets do. Dow today rose 1.39% or 222.57 points to close at 16,196.41 while the S&P500 climbed 1.65% (30.8) to 1,895.58. Most likely target is 16,600 (1,950) or if really garlicky 17,100 (2,000). Y’all should seize this countertrend rally to dump any remaining stocks you own or to buy index put options or bear ETFs. Put the proceeds into gold and silver. Dow in Gold rallied toward that uptrend line from the 2011 low, and before this episode ends with wailing and gnashing of stock investors’ teeth, should reach up to 14.00 oz, or even 14.75 oz. I would be surprised if it reached the 200 dma at 15.28 oz, but I reckon that’s possible. Hot ziggety! US dollar index gapped up a little and closed at 96.88, just on its 200 dma at 96.89. Rose 89 basis points or 0.98%. Hot dog, don’t mean a thing. Could climb to the last high at 97.50, even to the 50 DMA at 98.25, but to turn its trend upward, oh, my! Would need to close above 99.95. Meanwhile the past 11 months argues that the dollar has topped. Could always turn around, but that’s the weight of the evidence right now. The Chinese central bank’s move on Monday also sent oil higher, up to cut its 20 DMA, but this means nothing yet. Closed $29.12. Treasury yields also rose (bond prices fell) as hot money flipped out of bonds and back into stocks. Alas for the refugees, no safety lies in either! I’m driving up to Harriman for a grazing conference tomorrow, so I won’t be sending another commentary until Friday. Yes, our family farm raises grass-fed South Poll cattle and we are trying every way in the world to work with nature instead of against. Takes about three years to see the change, but suddenly the pastures explode with grass. Thanks again to all y’all praying for my wife Susan’s eye. It is slowly improving, but is still so bad she is making me drive, and she hates my driving. When she takes the wheel again, I’ll know she’s mended.